Have You Ever Been Under Put-in-Bay?!? For all of the attention paid to Put-in-Bay’s night life and attractions like Perry’s Monument, the underground caves still draw huge crowds… about 80,000 people a year to the Crystal Cave and its neighbor across the street – Perry’s Cave – also brings in up to 1,000 people a day. It’s 42 steps down a winding, stone staircase from Heineman’s Winery to Crystal Cave, home of the world’s largest geode – almost 40 feet in diameter – and a natural marvel of bluish-white crystals bursting forth from a sodium sulfate wall. The cave is a big reason the winery still exists. Cave tours are an enduring part of Put-in-Bay’s history, and the village’s two caves that remain open to the public continue to draw big crowds. The family-owned Heineman’s Winery was one of 17 operating on South Bass Island before Prohibition. When Prohibition shut down the wineries, Heineman’s survived in part because of the crowds drawn to the cave’s crystals and the money raised from tours. Workers digging a well at the winery discovered Crystal Cave in 1897. Perry’s Cave‘s origins go back almost a century earlier, when Commodore Oliver Hazard Perry is credited with discovering the cave and using clean water from the cave’s underground lake to nurse some of his sick, thirsty men back to good health. There used to be four caves open to the public, on an island where it’s estimated there are 25 to 30 caves on private property or obscured by wooded areas. Now it’s just Crystal Cave and Perry’s Cave across the street, both still drawing full tours of people interested in what’s going on below Put-In-Bay. For a first-time visitor to Crystal Cave, the staircase is steep and it’s not a bad idea to watch your steps as you descend 40 feet into the cave and a world where it’s 54 degrees all the time. The original cave was much smaller. People have removed some of the crystals so they could bring tours below ground. The crystals found in Crystal Cave are known as celestite, composed of the compound known as strontium sulfate. It’s a bluish-white translucent crystal, soft and brittle, and it’s extremely hard to polish and use for jewelry. The hardness of celestite is 3 on the Mohs scale. By comparison, a diamond rates a 10 on the scale. Each crystal in the cave has 10 exposed faces and the angles are the same on each crystal. Celestite is not used for anything in particular, though large crystals and geodes are prized by collectors. Geodes usually range in size from a softball to a basketball. 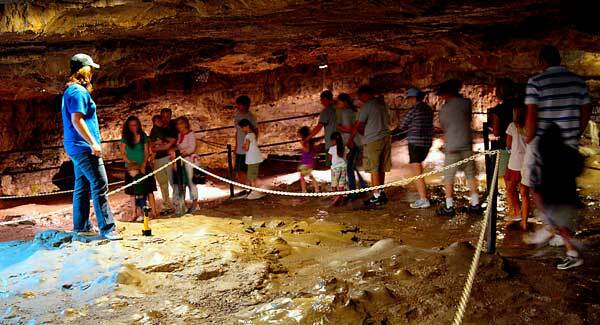 Crystal Cave is 30 to 35 feet across at its widest point. None of the other caves contain the large celestite crystals found in this cave, but small pockets of the material are known to exist in the area. There are no particular uses for the crystals, although they were mined and used in fireworks at one time. Some people come to the cave to meditate and be near the crystals due to their perceived healing properties. No one knows how old the crystals or how they formed. Where Crystal Cave’s focus is centered on the geode, Perry’s Cave offers the slow drip of natural rain water from its ceiling and the pointy landscape of stalactites, stalagmites and cave pearls in every direction. The cave is 208 feet long by 165 feet wide. All of the stalactites and stalagmites on the cave’s walls, ceiling and floor were created by heavily encrusted calcium carbonate deposits. These deposits formed from centuries of water dripping from the ceiling. Perry’s Cave is a naturally formed limestone cave that emerged about 20,000 years ago. Water from glaciers pushed two layers of limestone up from the ground. One of the layers collapsed and the other stayed up, forming the cave. In 1813, Commodore Perry used water from the cave to save some of his men from dysentery. The original owner of the cave cut off the cave’s stalagmites at their base and sold them. A subterranean tunnel in the cave goes 60 feet down and turns 100 feet to the left. The cave’s owner sent divers down in 1993 to explore the tunnel. The cave’s water level rises and falls with that of Lake Erie, indicating subterranean connections. Perry’s Cave, as an attraction, draws between 800 to 1,000 visitors daily when it’s busy, with 30 to 35 people on a given tour. An arch out front of Heineman’s was built with celestite taken from Crystal Cave. In the lobby of Heineman’s, near the cave entrance, there are black-and-white photos showcasing the village’s history. One of those photos features Daussa’s Cave (which later became known as Mammoth Cave). Dausssa’s Cave held an underground cave big enough that visitors could boat into the cave’s water. The village’s caves and wineries sometimes get overlooked by tourists when they think about Put-in-Bay’s history. In Put-in-Bay’s heyday around the turn of the 20th century, the Hotel Victory was considered at that time the world’s largest summer resort with roughly 800 rooms. Hotel Victory had trolleys that ran to the caves. It also used water taken from Perry’s Cave to supply its guests with drinking water. When people think of Put-in-Bay, they think of it as a place to party. But it is so much more than that! Previous Previous post: What Happens at Put-in-Bay in the Winter?